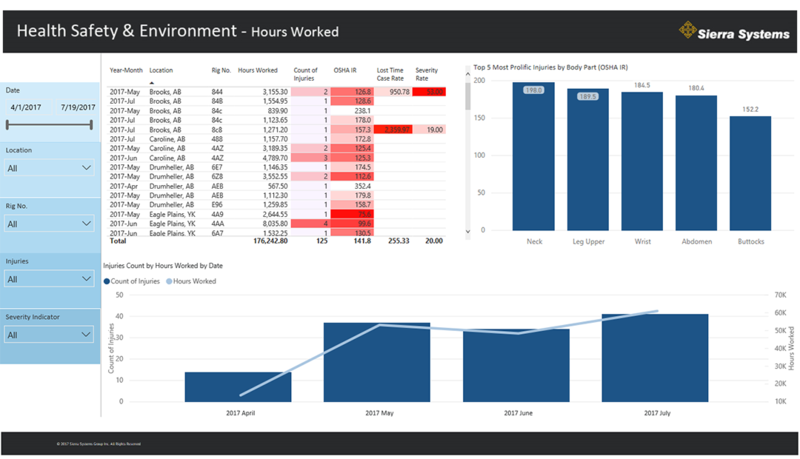 HSE is a Power BI solution that delivers complex data visually for the Oil and Gas Industry. It provides performance indicators for a wide variety of Health, Safety, and Environment areas and issues. Designed to mirror industry standard data HSE can deliver insight to prevalent problems found throughout the industry providing companies the ability to minimize effort finding and tracking key metrics. The Health, Safety, and Environment solution allows in-depth analysis to be carried out, reviewed, and displayed in a visually appealing and informative manner. It allows the user to compare a wide variety of metrics and data sets from which conclusions and data backed observations can be made. 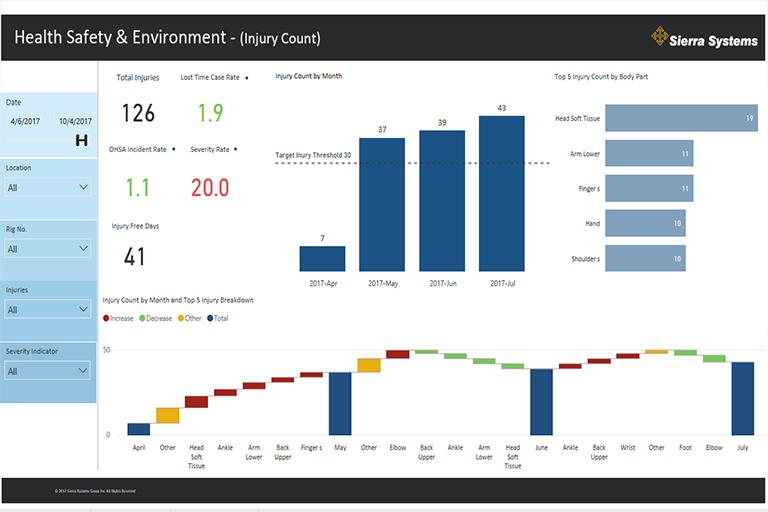 This section offers users a corporate overview of HSE incidents over time with customizable options to emphasize key industry measurements. All data is filterable by several industry variables; OHSA, Severity, and Lost Time Case data. Top 5 influencers that influenced the change in the monthly Injury count. This section affords a deeper review of the most injured body parts and the severity of injury. 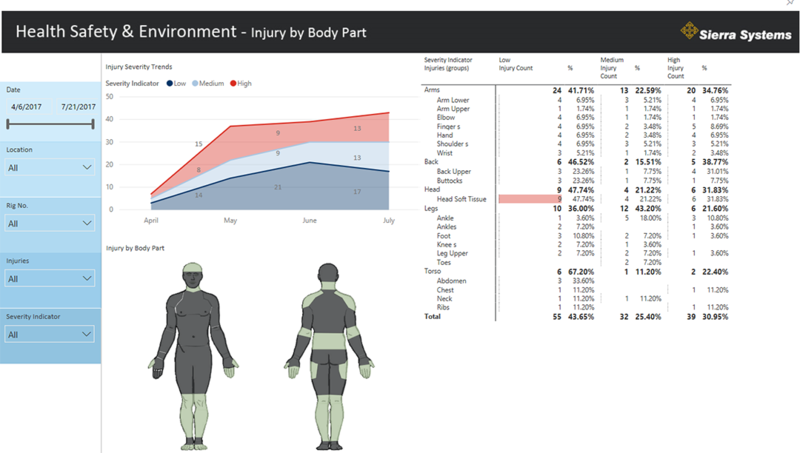 The Human Body Synoptic Panel allows exact body parts to be specified and drilled into with subsequent charts dynamically changing based on selections made. A detailed matric highlights a breakdown of both the body part group as well as the specific body part. Data is displayed that can be sliced by both Location and Rig, allowing the user to see any problem areas with clear indicators. A matrix offers users a breakdown of injured body part (grouped) by both location and rigs within each location. 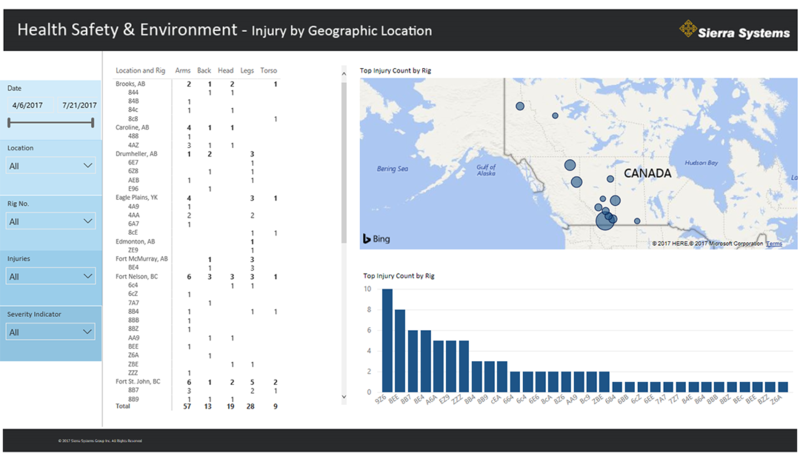 A geographical representation indicates injury counts per location with the ability to drill down into the data for further rig detail. A corporate view integrates hours worked per injury, crucial for auditing, while indicating HSE performance for industry regulators. OSHA calculations are utilized to chart and highlight which body part is injured the most prolifically. 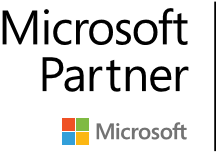 Want to become a Power BI Partner? Certified partners are an important part of the team! Find new business opportunities, make connections, and share your company’s talents and experience with Power BI users around the world.